Paper-thin slices of prosciutto are turned into a salty, crispy “crust” in this quick chicken thigh recipe with mushroom sauce that serves two. Serve with mashed potatoes and steamed greens. 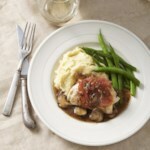 Sprinkle chicken thighs with ⅛ teaspoon pepper and wrap each with a slice of prosciutto. Heat 1 teaspoon oil in a medium nonstick skillet over medium-high heat. Add the chicken and cook, turning once, until browned on both sides and cooked through, 4 to 5 minutes per side. Transfer to a plate; tent with foil to keep warm. 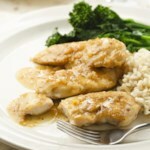 Reduce heat to medium and add the remaining 1 teaspoon oil, shallot and 1½ teaspoons oregano to the pan. Cook, stirring, until the shallot is beginning to brown, 1 to 2 minutes. 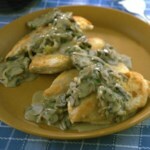 Add mushrooms and cook, stirring, until browned in spots, 3 to 5 minutes. Add Marsala (or sherry), return heat to medium-high and cook 2 minutes. Whisk broth, cornstarch and the remaining ⅛ teaspoon pepper in a measuring cup; add to the pan, stirring. Return to a simmer and cook, stirring constantly, until the sauce is thickened and glossy, 2 to 3 minutes more. 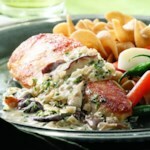 Serve the chicken with the mushroom sauce, sprinkled with the remaining ½ teaspoon oregano. 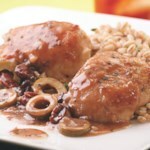 Tip: Marsala, a fortified wine from Sicily, is a flavorful addition to many sauces. Don't use the “cooking Marsala” sold in many supermarketsit can be surprisingly high in sodium. Instead, purchase Marsala that's sold with other fortified wines in your wine or liquor store. An opened bottle can be stored in a cool, dry place for months.